Media sources indicate the Montreal Canadiens have begun serious negotiations to sign Pavel Valentenko and Alexei Emelin out of Russia with Valentenko being the top priority. Greatly impressed Canadiens scouts during the World Junior Championships with his hard-nose style of play and heavy shot. Even though he's a defensive defenceman Valentenko has shown the maturity and skill needed to play with the 1st powerplay unit. His bone-crushing hits and physical play in front of the net are qualities the Montreal Canadiens are in need of and his command of English is already at a level that makes him teachable in North America. Valentenko is very much a team player and with role models like Fetisov and Pronger it's easy to envision his style of play. Skating: A mobile, defensive defenseman with above-average skating. Skates very well backwards. Shot: Shoots the puck very well. Possesses a hard slapshot but needs to work on his accuracy. Able to vary the delivery of his point shots, either lifting the puck or leaving it on the ice for a redirect. Technical Ability: A dependable player who can handle the puck and carry it out of the defensive zone. He isn’t blessed with great hands, but is still above-average in this area, and doesn’t try to overhandle the puck. Passing: Capable of making straightforward passes with good precision, though he does not excel at creating scoring chances with his passing. Hockey Sense: Not a particularly creative player. Understands how plays develop in his own end, but doesn’t see the ice that well in the attacking zone. As a result, Emelin tends to defer the playmaking chores to teammates. His offensive upside is mainly limited by his shooting ability. Defensive Play: Very reliable in his own zone. Plays aggressive, proactive hockey, likes to confront opponents and fights hard all over the ice. 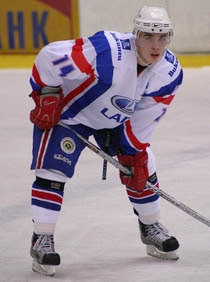 At times, Emelin can be overly physical and rough which routinely results in two or three roughing-type penalties each game. Physical Play: A very aggressive and physical player. Uses his body well and can lay down some punishing checks. He's very effective near the boards and tends to commit an inordinate amount of fouls away from the puck. Overall: Given his mobility, aggressiveness and ability to hit, Emelin’s style is somewhat reminiscent of a young Darius Kasparaitis. Emelin has another year on his contact with Lada but the team is now in financial trouble, opening the door for GM Bob Gainey to buyout his contract or sign him outright should Lada fail to pay the player's salaries. This year's World Hockey Championships will be very telling as both he and Pavel Valentenko have been invited to tryout for Russia. 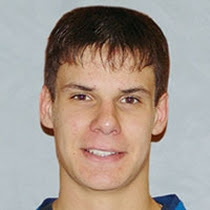 Also worth watching will be Konstantin Korneev, a right-handed offensive defenceman who was drafted by the Habs 275th back in 2002 and has also been invited to tryout for the Russian national team.